Read this article to learn what a Parent-Child hierarchy is and how to use them in the Zunos Administrator Portal. Use libraries to distribute and share content to your linked children accounts. This will ensure that content management is centralized and maintained in the parent account. Once a linked file is created, all linked files in the Parent account function as independently linked files. Any linked file in Child accounts can have its settings changed and be renamed by Admins in the Child account. However, replacing or updating the linked file must be actioned by an Admin in the Parent account. In Libraries, linked content will display the blue chain to indicate the library content is linked from another Parent org. Files displaying a green chain means that the file is linked in a Live Content folder. See the top right of the respective media/folder icon to view the linked chain icons. In order to share a Library to a Child account from a Parent account, you will need to create a new Broadcast Channel Tag. Once the tag has been created in the Parent account Settings, click on the Details Pane beside the name of the Library that you would like to share, and enter the name of the Broadcast Channels' Tag. Once a Library has been shared to a Child account via Broadcast Channels, any Admin in the Child account can link the files anywhere within that Child account. This can be done by simply dragging shared library content into their organization’s Published content/live content section. As an Admin in the Parent Account, you have the ability to view all the linkages of the files you have shared using Broadcast Channels. You can also choose to remove all linkages or update the linked files by using the re-upload function in the files settings. 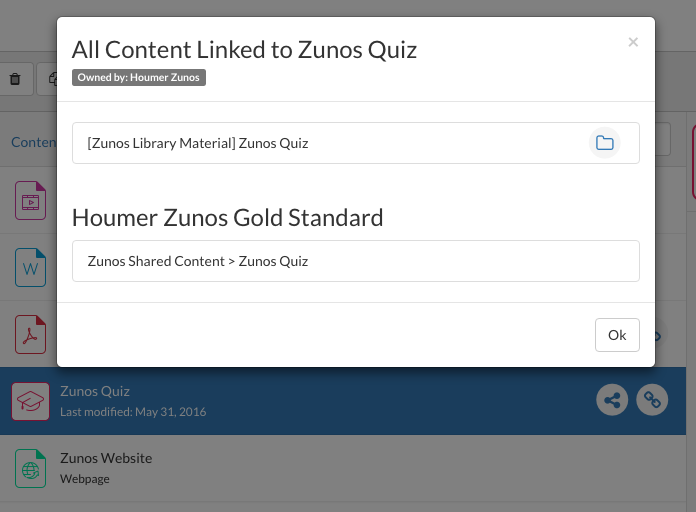 Content files such as quizzes, content, message templates, forms.